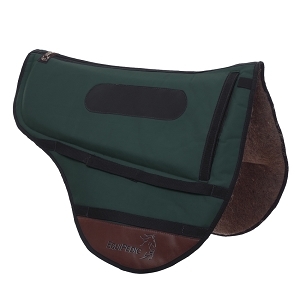 EquiPedic's Endurance and English saddle pads. Aptos, CA, (May 18, 2003) – EquiPedic, Inc. has enhanced its line of saddle pads that regulate the surface body temperature of horses. These new endurance and English pads are made with Holofiber™, a break-through responsive textile that has been shown to increase the transcutaneous oxygen levels in the human body by 8-12%. These pads will debut at the Western States Horse Expo on May 31, 2003 in (venue). Equipedic’s patent-pending technology that combines phase change material, and the advanced pressure-relieving material from Tempur-Pedic, Inc. has now added Holofiber, a proprietary patent-pending textile that works with the body’s own energy system to increase oxygen levels, build strength and accelerate muscle recovery. Holofiber is manufactured and marketed by Hologenix, LLC in partnership with Wellman, Inc. The Equi-CHARGE Oxygenated Energy Recovery System™ (OERS) uses Holofiber to increase transcutaneous oxygen levels. The statistically-significant increase of blood flow and increased oxygen levels was demonstrated in a double blind study on diabetic and vascularly-impaired patients performed by Dr. Lawrence A. Lavery, MPH at Loyola University Medical Center in Chicago, IL earlier this year. Dr. Lavery stated, "The significant changes observed are very compelling for this type of product. An 8-to-12% improvement in skin oxygenation could increase marginal circulation enough to improve wound-healing or eliminate ischemic (localized tissue anemia due to the obstruction of inflow of arterial blood) pain …". Extensive equine testing is continuing to validate comparison between human and equine results, and to determine added benefits. The combination of Equi-CHARGE OERS, the EquiKOOL™ Temperature Management System and the Tempur-Pedic advanced pressure-relieving material can turn the saddle pad into an active cooling, rapid energy recovery, and comfort management system that is unmatched in the industry. These saddle pads can actually lower the body surface temperature of the horse for extended periods while protecting its back. Additionally, the pads are orthopedic, anti-slip, anti-bacterial, anti-fungal, and machine washable. The system provides the ability to keep horses 4-to-7 degrees cooler for extended periods of time, can increase transcutaneous oxygen levels in the area under the saddle, and gives the horse superior comfort levels. "These unique features can give the rider and the horse an extraordinary advantage when performing, especially in endurance, 3-day eventing, and hunter/jumper events", said Richard Sacks, EquiPedic’s CEO. PRODUCTS: Has introduced a saddle pad that regulates the body temperature and increases the trancutaneous oxygen transfer of a horse. In conjunction with mattress-makers Tempur-Pedic, it also offers a more comfortable fit for a horse while absorbing more shock for the rider.